The app that every music geek wants to play with. A true testament to the music technology prowess and knowledge held by the Hydric team, Playground was an internal project that aimed to bridge the gap between Spotify technologies and non-technical users. Due to Hydric’s already considerable experience at the time, we gained early access to the Spotify APIs when they were redeveloped in 2016. It was specifically our core team’s history of working with the Echo Nest technology, which Spotify was redeveloping as a new recommendations endpoint, that made Spotify keen to see what Hydric would be able to do with access to the new endpoints. 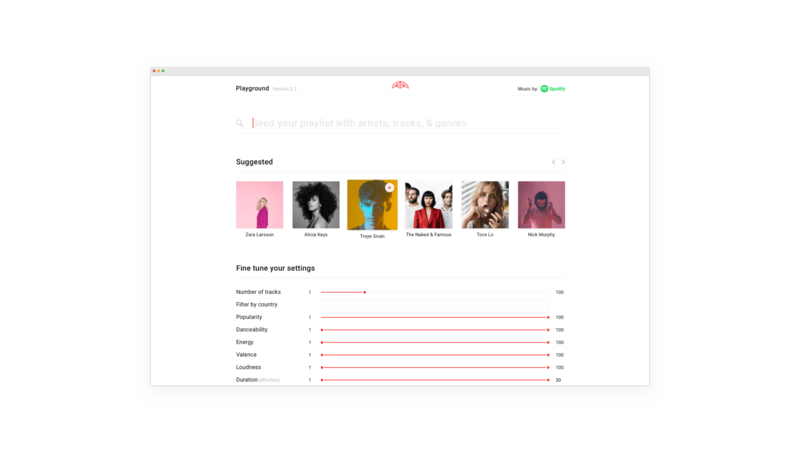 The recommendations API allows you to create a playlist-style listening experience based on seed artists, tracks and genres and various combinations of acoustic attributes. While this is an incredibly powerful piece of tech, experimenting with it was limited to developers. During our initial discovery of Spotify's new recommendations API, we were excited by how expressive and useful it was proving to be. However, we quickly realised that for non-technical users who might want to interact with this new feature, navigating and gaining access to them could prove difficult. Out of this process Playground for web and iOS was created, a sandbox for the Spotify Recommendations API that demonstrates the track recommendations delivered by selecting seed artists, tracks and genres, along with different combinations of acoustic attributes. 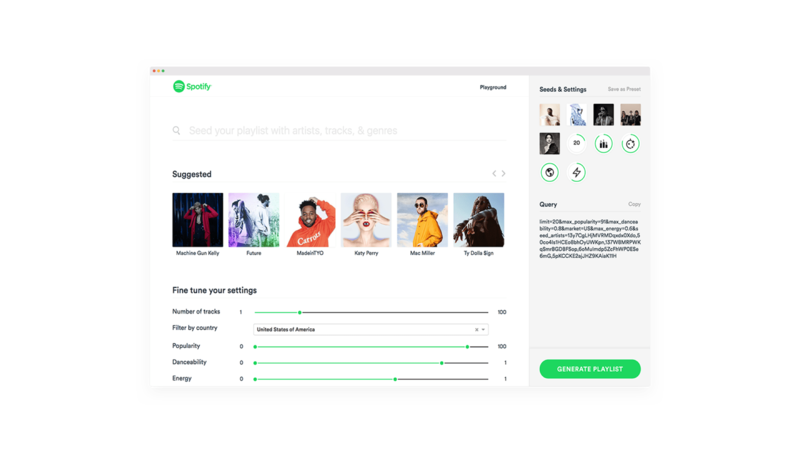 It allows users to generate unique Spotify playlists using these acoustic attributes, as well as provide a tool for brands to identify which musical attributes might best represent them in collaborations with the Spotify Ad Solutions team. 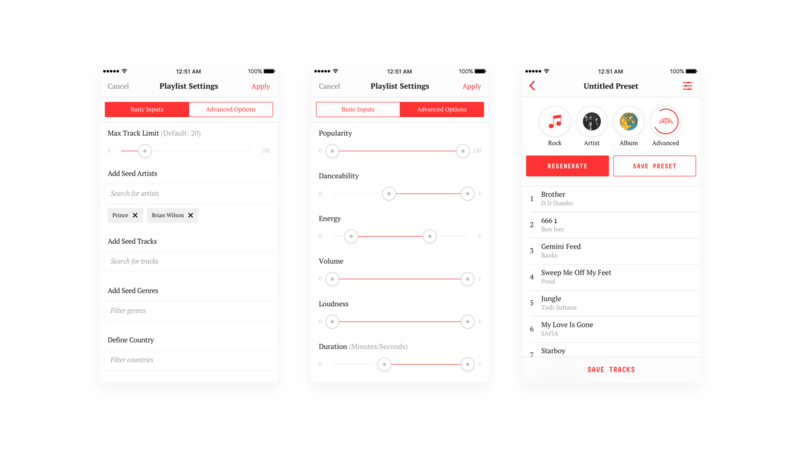 In addition, the ‘presets’ functionality allows users to group and title a specific set of musical attributes, which could then be saved for later use or easily shared with other users. It has since become an invaluable internal tool for assessing the quality and nature of recommendations in our own work with major brands. Spotify agreed that it was a critical tool for anyone designing experiences based on their APIs - the tool was promoted in Spotify’s blog post publicly announcing the new APIs. In March 2017 Spotify acquired Playlist Playground for web. Hydric continues to work with Spotify to continually improve and expand on Playground’s capabilities.